Home > Books > Where Is My Skate? 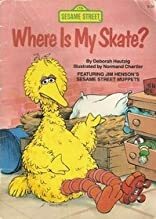 Where Is My Skate? was written by Deborah Hautzig and Sesame Street. Where Is My Skate? was published by Random House Books For Young Readers. Subjects of Where Is My Skate? include Fiction, Lost and found possessions, Non-Classifiable, Puppets, and Roller skates.